Carpets have been collector’s items for centuries: we know from inventories that Henry VIII owned several hundred Turkish rugs, some of which appear in his many portraits by Hans Holbein — the paintings preserving the memory of objects that have nearly all since disappeared. Keen Persian rug collectors included Cornelius Vanderbilt and Sigmund Freud, who kept a rug draped over the couch on which his clients would sit. Antique Oriental rugs were woven on a traditional loom with strands of cotton, silk or wool, called warps, stretched vertically between two wooden horizontal beams. The weaver then passed rows of silk, cotton or wool, called wefts, in alternation over and under each adjacent warp. The warp and the weft constitute the basic foundation of most carpets. The weaver then repeatedly introduces rows of looped ‘knots’ in between several wefts that are then uniformly clipped to produce the pile. The higher the number of knots the finer the rug will be, and the more intricate the pattern will become. This technique proved so effective that carpets are made using these same methods today. Most carpets and rugs are classified by the surroundings in which they were woven — whether hand-woven upon the small loom of a nomadic tribe, part of a cottage industry within a local village, or produced in a professional or royal workshop within a city. Tribal carpets: nomadic, or tribal carpets, like the Yomut carpet below, are produced by different ethnic groups; predominantly woven for the tribe’s own use, rather than as commissions or to be sold, their designs are a reflection of distinct histories and traditions. While there was no limit to the length a carpet could be, the width of these rugs could never exceed eight feet (around 240 cm), the standard size of the loom. Village carpets: carpets such as the Kazak rug below were produced in settled environments: the loom was erected within the home and the carpets woven without a drawn design, relying on the memory of the women who wove them. This strategy meant that each of the carpets contained small idiosyncrasies, both in their construction and pattern — a factor which only adds to their charm. Upon completion, carpets were taken to the nearest regional market, where they would carry the name of that village. Here, they would either be sold to locals, or handled by a merchant for export. Town carpets: cities such as Tabriz, Heriz and Kashan (see example below) are synonymous with carpet weaving. In the last quarter of the 19th century workshops were established specifically to meet the demands of the Western market, with master weavers overseeing the production of finely woven rugs and carpets. One of the most famous workshops in Kashan was that of Hajji Mollah Hassan Mohtasham, whose carpets are recognisable by the harmony of their design and colouring, the purple silk finish of the selvedge (the material binding each side cord) and the maker’s consistent use of the very best wool, which contained a particularly high quantity of lanolin. 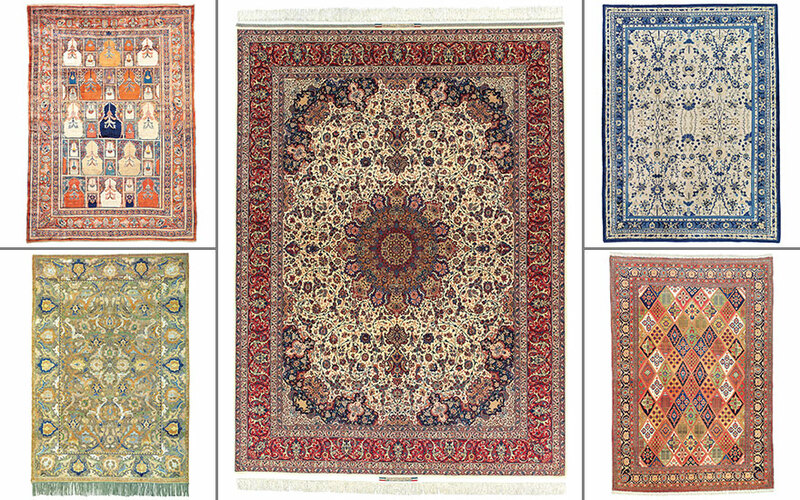 Ziegler: by 1883, European demand for Persian carpets had grown so great that the Manchester-based firm Ziegler & Co. (see below) opened its first factory in the district of Sultanabad, west Persia. Perhaps one of the most important aspects to consider when buying a carpet is its design. Is it balanced, well-spaced and harmonious? Does it have a sense of movement, spatial depth and clarity? If these elements are lacking then very often the design may have been misunderstood and you can be left with a carpet that is visually incoherent. Some designs have been used repeatedly throughout the centuries in various guises. Early 16th and 17th-century Safavid motifs have remained particularly popular, such as those seen on the Kirman ‘Vase’ carpets of southeast Persia and the intricate ‘in-and-out’ palmette designs of Isfahan gallery carpets, including the above example sold in October 2017 for £35,000, and a much later 20th-century Tabriz carpet (below) sold by Christie’s in April 2017 for £25,000. The harmonious patterns of layered planes of scrolling vines, punctuated with bold palmettes and twisting cloud bands is deceptively complex but creates a natural rhythm that is extremely well balanced. Although these two carpets were woven nearly 300 hundred years apart very little has changed in their appearance, illustrating how the very best designs really do stand the test of time. Antique carpets benefit markedly from the use of hand-spun, naturally dyed yarns, the subtleties of which cannot be reproduced by synthetic dyes. Synthetic dyes began to be used in around 1860, and many collectors disregard carpets woven after this point because they do not have the soft hues and nuances of natural dyes. They also fade over time. Certain colours are considered rarer than others and are actively sought after, such as Tyrian purple, saffron yellow, cochineal rose and certain shades of green. A telltale sign of whether or not a carpet is woven with naturally dyed wool is if it includes tonal changes within a certain colour, forming visible bands called abrashes. These occur because each batch of dipped yarn has a marginally different saturation of dye. As with any work of art, antique carpets require a certain amount of care and attention. Generally speaking, the earlier the rug was woven, the more wear and restoration is acceptable, with collectors placing more importance on rarity and artistic merit than on condition. If a rug has been restored too much, however, or restored to a poor standard, this can have a negative impact on the overall appearance and value of a carpet. Chemical washing, extreme sun-fading, staining or a reduction in size are all things to look out for, because they are often irreversible and will inevitably affect the rugs’s value. Silk fibres are much more fragile than wool and as a result they are more prone to wear. They are also susceptible to humidity, and if they become wet and then dry incorrectly the foundation will become dry and brittle, and splits will begin to appear. If an antique carpet has been well cared for, however, it can last for years — much more so than a lesser quality, commercially produced modern rug. It is important to clean a carpet regularly. This can be done with a domestic hoover on a light setting, but if it requires a more thorough clean it should be handled by a professional carpet cleaner. Before storing carpets, roll them from the bottom, pile facing inwards. When storing a silk carpet roll it with the pile on the outside, because this places less strain on the foundation. Never fold a rug or carpet because this will cause it to crack over time. Damage by insects, flooding and mildew are the most common problems we see when a carpet has been poorly stored — it is important to check on them regularly.